Graduation parties across the country will never be the same again, now that TapSnap has come along. Portland-based TapSnap franchisee Scott Farestrand had four graduation parties in one week. “In nine days, I had four grads and two weddings,” says Scott. As you might imagine, he didn’t get much sleep. “It was really interesting to see how different kids responded to the machine,” he says. “The girls really seemed to like it and pulled the boys in. 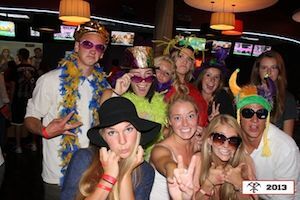 They loved playing with the mustache props and all that goofy stuff.” The graduation party he did for Wilson High School was at Big Al’s bowling and entertainment complex. “They had bowling, a casino room, video games and more,” says Scott. Another grad he did was Cleveland High School’s party was at the Mittleman Jewish Community Center, where the grads took full advantage of all the facilities – the swimming pool, basketball courts, a rock climbing wall and more. They also set up a casino room and a bingo room, played Dance Revolution and were entertained by a hypnotist, as well as TapSnap. “We did not connect live to Facebook at any of the events because of the concerns of the parents,” says Scott. Kim Deimling’s TapSnap entertained 300 graduates of Park City High School in Utah. “It was as festive as you can get,” says Kim. TapSnap fit right in with the event venue, the Jupiter Bowl, an upscale, high-tech entertainment complex with bowling, billiards, multiple TV screens and more. "TapSnap was an awesome way to make the night memorable,” says graduate Alex Miele. 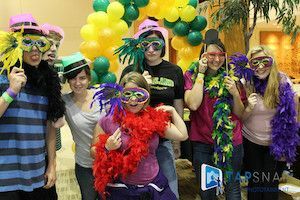 “We had tons of fun dressing up and goofing off and got copies of all our favorite pictures to remind us of all the good times we had. I would recommend this for people of all ages. Everyone can have fun with this!" On the giant screens above the party, a slideshow created by yearbook staff celebrated the highlights of the year gone by, while below graduates created new memories with TapSnap. “TapSnap provided good, clean drug and alcohol free entertainment, and the kids were all over it, instantly sharing their pics on Facebook. They were so cute with the props,” says Deimling. In New York City, Ben Avery Garcia will celebrate two very special occasions with TapSnap – his graduation from Vanguard High School and his birthday – at the Poet’s Den Gallery and Theatre in Harlem. His mother Veronica Citron, who is planning the party says she chose TapSnap because it’s like “a party going on live.” She was considering a traditional photo booth but loved that TapSnap doesn't take up much space. Ben and about 75 of his friends will be out in formal wear for the upscale occasion, with a DJ and TapSnap providing the main entertainment. The venue is a trendy gallery where they showcase new local artists and it will be done up in royal blue and white, so TapSnap will fit right in.